Member for Mining and Pastoral Region. Elected to the Twenty-ninth Parliament from 22 May 1977 for Lower North Province in succession to Stanley James Dellar (defeated). Re-elected 1983. Elected to the Thirty-third Parliament from 22 May 1989 for Mining and Pastoral Region. Re-elected 1993, 1996, 2001, 2005, 2009 (for terms commencing 22 May). Father of the Legislative Council from 22 May 1997. Retired 21 May 2013. Trustee, Parliamentary Superannuation Fund: 5 September 1989 - 3 June 1992. Parliamentary Secretary to the Cabinet 5 March 1980 – 25 January 1982. Minister for Education, Employment and Training, and Minister assisting the Minister for Commerce and Trade: 16 February 1993 - 25 August 1993. Minister for Education, Employment and Training, Sport and Recreation: 25 August 1993 - 10 February 1995. Minister assisting the Minister for Commerce and Trade: 16 February 1993 – 10 February 1995. Minister for Education, Employment and Training, Sport and Recreation, and Parliamentary and Electoral Affairs: 10 February 1995 – 21 December 1995. Minister for Employment and Training, Tourism, Sport and Recreation, and Parliamentary and Electoral Affairs: 21 December 1995 - 9 January 1997. Minister for Mines, Tourism and Sport and Recreation: 9 January 1997 - 22 December 1999. Minister for Mines, Tourism, Sports and Recreation, Racing and Gaming: 22 December 1999 - 9 February 2001. Leader of the Government in the Legislative Council: 26 April 1996 - 9 February 2001. Minister for Justice: 12 June 2012 - 29 June 2012. Minister for Mines and Petroleum; Fisheries; Electoral Affairs: 23 September 2008 - 21 March 2013. 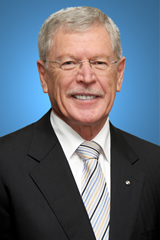 Leader of the Government in the Legislative Council: 23 September 2008 - 21 March 2013. Secretary to Shadow Cabinet 1984. Shadow Minister for Aboriginal Affairs, Housing (until 13 March 1984). Shadow Minister for Sport and Recreation (from 13 March 1984). Shadow Minister for Regional Development and North-West (from July 1984). Shadow Minister for Transport (from 1985) March 1983 – 19 March 1986. Shadow Minister for Education, Consumer Affairs, Youth, Family and Women's Interests 19 March – December 1986. Shadow Minister for Youth, Education, Community Services (until 26 April 1988). Shadow Minister for North-West (from 26 April 1988) December 1986 – 7 March 1989. Shadow Minister (Coalition Shadow Minister from 24 November 1992). Shadow Minister for Mines, North West, Goldfields, and Lands (until 24 November 1992). Member of Opposition (later Coalition) Management Team 24 May 1992 – 16 February 1993. Leader of the Opposition in the Legislative Council: 16 February 2001 - 23 September 2008. Shadow Minister for Kimberley; Mines: 16 February 2001 - 31 December 2001. Shadow Minister for Resources Development; Mines; Kimberley; Pilbara: 1 January 2002 - 20 March 2005. Shadow Minister for Electoral Affairs; Mines and Resources; North West: 20 March 2005 - 4 February 2006. Shadow Minister for Policy Development: 4 February 2006 - 8 April 2006. Shadow Minister for Policy Coordination: 8 April 2006 - 23 September 2008. Member, Standing Committee on Government Agencies 1982 – 11 May 1994; Chairman 1990 – 1993. Additional Member, Estimates and Financial Operations Committee to consider the Estimates for 1990-1991 and for 1991–1992. Chairman Select Committee on Aboriginal Poverty 1984–1985. Member, Select Committee on the Allocation of Funds by the Aboriginal Liaison Committee 1986. Select Committee on a Matter of Privilege relating to the Select Committee on the Burswood Management Limited 1988. Select Committee on a Matter of Privilege relating to Soccer Federation of WA, Newsletter Attack, Hon Samuel Piantadosi 16 October – 14 November 1991. Chairman, Select Committee on Rules, Orders and Usage of the House 5 December 2002 - 12 March 2003. Member, Select Committee into the Department of Education and Training: 15 November 2006 - 7 August 2008. Member, Select Committee into the Appropriateness of Powers and Penalties for Breaches of Parliamentary Privilege and Contempts of Parliament: 12 November 2008 - 7 May 2009. Born 24 August 1945, Kalgoorlie, Western Australia. BA, Dip. Ed. Secondary school principal. Mining and Pastoral Region includes the Legislative Assembly electorates of Eyre, Kalgoorlie, Kimberley, North West and Pilbara.